In this June 13 photo, a residence in the Figueroa neighborhood stands destroyed nine months after Hurricane Maria, in San Juan, Puerto Rico. On Wednesday a federal judge extended a temporary housing program for territory residents whose homes were destroyed. Federal Judge Timothy Hillman in Massachusetts issued a ruling on Wednesday adding several weeks to the Transitional Sheltering Assistance program now set to expire on Aug. 31. The agency had planned to end it on June 30. Through TSA, FEMA provides direct payments to hotels and motels that house hundreds of individuals and families who were forced to evacuate after the back-to-back hurricanes caused severe damage to homes across the island last year. The Rev. Jose Rodriguez, an Episcopal priest in Orlando, Fla., and a member of the steering committee for Vamos 4 PR, an organization that works with hundreds of families enrolled in the temporary housing program, said people are desperate to find stable housing. "The people who remain in hotels are the people with the fewest options," he told NPR. "They are the sickest, the disabled, the elderly and the single mothers, who really need the help of the government." He said he is in contact with hundred families. Rodriguez noted FEMA is offering those who opt out of the program a one-way return ticket to Puerto Rico, "which basically is sending them off to be homeless because, by definition of being in the program, they have no homes to go home to." A FEMA spokesman told NPR the agency "is working to comply with the order. Beyond that FEMA will not comment on pending litigation." In addition to the temporary restraining order that bans FEMA from shuttering the program, the civil rights advocacy group behind the lawsuit, Latino Justice, contends the federal agency has "unreasonably delayed or unlawfully withheld" aid from Puerto Rican evacuees "placing them at risk of significant, irreparable injury." The suit seeks to compel the agency to provide direct financial assistance for Puerto Rican hurricane victims utilizing the programs it makes available to survivors of natural disasters on the mainland. 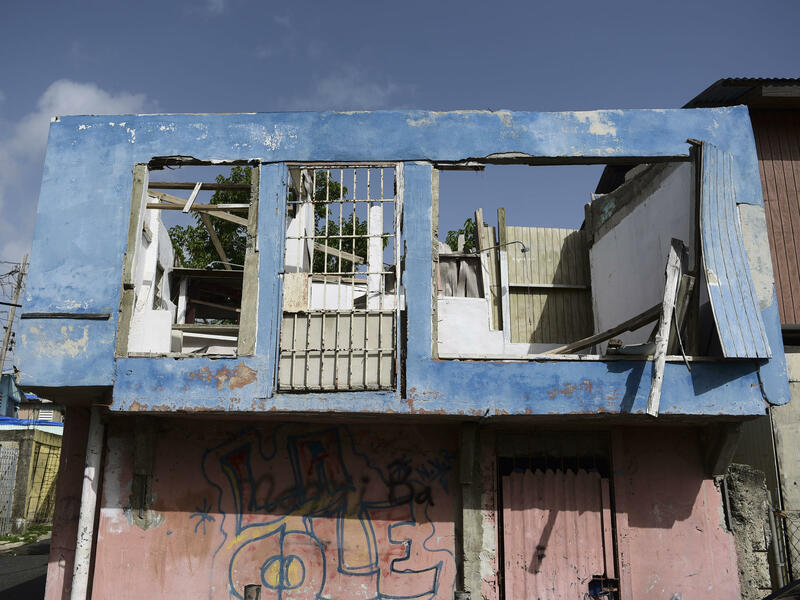 The complaint cites continued aid given to victims of Hurricane Harvey, which struck Texas in August 2017 — a month before Maria hit the Puerto Rico, a U.S. territory. "While hundreds of Hurricane Harvey victims remain sheltered in hotels and motels and thousands more are safe in alternate housing arrangements made by or through FEMA, the agency seeks to evict" Hurricane Maria survivors from the current homes, it reads. Lawyers for displaced families argue the federal agency's conduct violates Section 308 of the Stafford Act, "which requires nondiscrimination in disaster assistance," according to court documents. Natasha Bannan, an associate counsel with Latino Justice, told NPR that FEMA has numerous programs in place to help displaced families living on the mainland and on Puerto Rico. "They could offer long-term rental assistance, they could underwrite the costs of leases, they could provide direct financial assistance," she suggested. Additionally, she added, homeless Maria and Irma survivors should be eligible for interagency programs administered by the U.S. Department of Housing and Urban Development. The Disaster Housing Assistance Program covers the security deposit, rent and utilities for displaced disaster evacuees. It was created under the George W. Bush administration following Hurricane Katrina, and has been made available to those displaced by Hurricanes Katrina, Ike and Sandy, among others. Puerto Rico is in full-on disaster-response mode after powerful Hurricane Maria hit yesterday. There is no power on the entire island and almost no running water. There have been landslides, flooding and widespread structural damage.